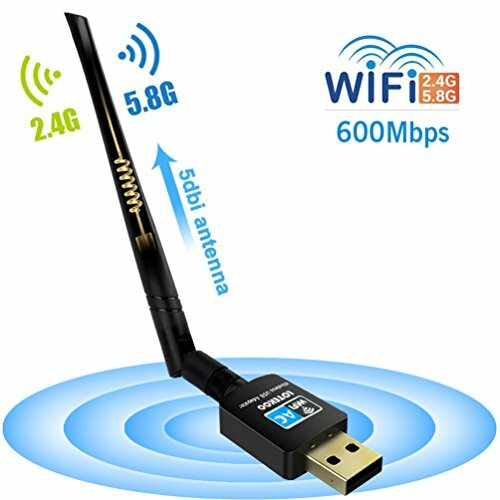 By plugging this LOTEKOO Long Range USB WiFi Adapter to your desktop, laptop, PC or MAC, you can get extended Wi-Fi speed of 433Mbps on 5GHz WiFi band or 150Mbps on 2.4GHz. You can use the 5GHz wireless band for lag-free gaming and HD streaming, and the 2.4GHz band for video calls and shopping online. Windows 10 is plug and play: No drivers required. - Support WPS one key encryption, free you from remembering troublesome password. - Support Soft AP function: Soft AP Mode will create wilress WiFi signal if your computer is under wired Internet connection. - CCA Technology: Enhances your signal stability by automatically avoiding channel conflicts. - Support Systems: Windows 2000/XP/Vista/7/8/8.1/10, MAC OS 10.4-10.13. 【Big PROMOTION Item】【Ultimate Wi-Fi Speed】-- This usb network adapter adopt the latest & most powerful wifi protocol, 3 times faster than wireless N speeds. Ultra-fast dual band 5.8GHz/433Mbps or 2.4GHz/150Mbps Wi-Fi performance to stay away from lags and freezing! 【Powerful 5dBi High Gain Antenna】-- Comes with long range wifi antennas of 5dBi, allows you to pick up wireless signals from long distance. Flexible antenna and Beamforming+ technology help boost speed, range and reliability, better WiFi peformance than others 2dBi/3dBi/mini size wifi adapters! 【Universal Compatibility】-- Plug and play for Windows 10, No drivers required! Support Windows 10/8.1/8/7/Vista/XP/2000, Mac OS 10.4-10.13. Works with any Wi-Fi routers, upgrade your PC,laptop or Mac to work with the latest AC WiFi router for faster speed and extended range. 【Soft AP & WPS Function】-- Soft AP Mode creates a Wi-Fi hotspot for mobile devices if your computer is under wired Internet connection. WPS encryption method remembers and protects password by pushing the WPS button of your router and wireless usb adapter, free you from remembering long passwords. 【Awesome Warranty Service】-- Completely free 18-months warranty and lifelong time technial support. Quick response within 18hours! Setup CD included, you could also download driver from this link "https://goo.gl/WdxJTV"
If you have any questions about this product by LOTEKOO, contact us by completing and submitting the form below. If you are looking for a specif part number, please include it with your message.